Adrián Gómez-Brandón (ESR, UDC) has obtained the Capocelli Prize 2018, awarded by the Data Compression Conference (DCC) program committee for an outstanding student authored and presented DCC paper. 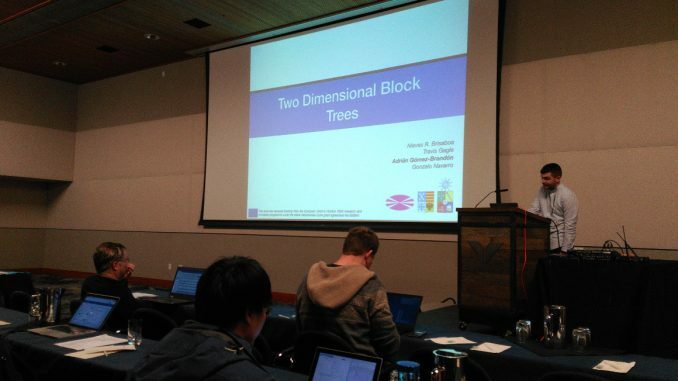 The award-winning work, “Two-Dimensional Block Trees”, includes the research results obtained during his secondmens to UCHILE within BIRDS project (WP3). Along with Gómez-Brandón, its is co-authored by Nieves R. Brisaboa (UDC), Travis Gagie (former UH, now University of Diego Portales, Chile) and Gonzalo Navarro (UCHILE). Adrián Gómez-Brandón is currently doing a research stay at the University of Melbourne (Australia), also in relation to BIRDS project.